We let one apartment in the House "Diamant" situated directly at gondola and skiing pist. The apartment has 2 rooms, a bathroom and a balcony - in total 47 sqm. In the sleeping room you find the double bed (size:2 mattresses a 0,90 m x 2,00 m) the wardrobe (including a safe) a table and a share. 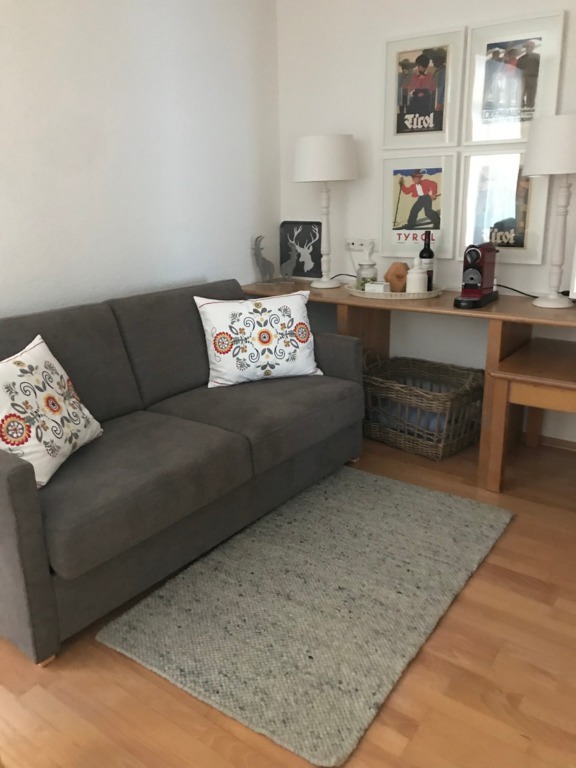 The combined dining and living room provids for the kitchen and dining talbe on one side and a living area with a sofa (convertible in a bed for max. 2 people (1,40 m x 2,00 m) armchair, asideboard with TV. From the dining area you see the skiing pist and can enter the balcony. The apartement is let with towels and bedclothes. Skis and shoes can be left in the storages in the ground floor. A small supermarket is nearby. The apartment is let only to non-smokingers. Pets are not allowed. The apartment is directly situated at Festkogel Gondel (50m) with view to the skiing pist. A parking is available behind the house.